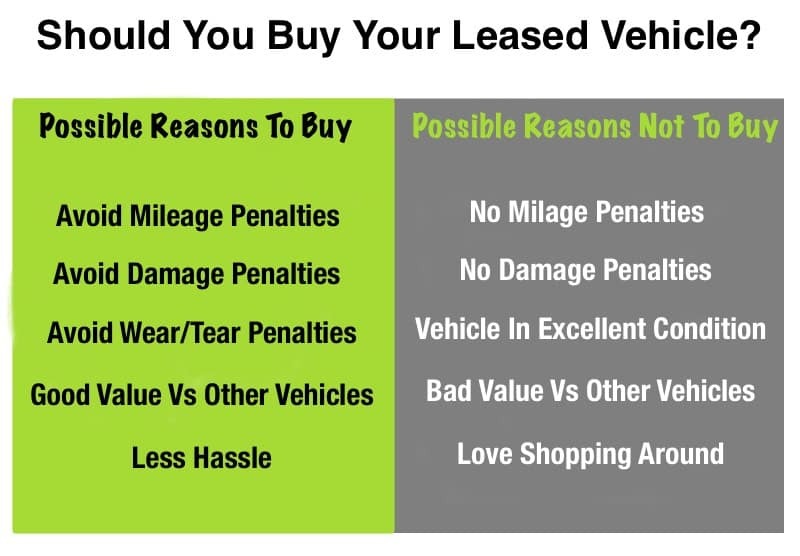 A decision many car, truck and SUV lease owners need to make, is should they buy their leased vehicle at the end of it’s contract or buy or lease a new vehicle. We walk you through several scenarios where Buying A Leased Vehicle is a good option to make. Leasing can get quite confusing with all the variables that can come into play, because you’re essentially renting a car and don’t own it. Unlike when you purchase a vehicle, you’re responsible for making sure the car is in good condition at the end of the lease term. Any damage, wear or excessive miles occurring during the lease term can cost you money. Those who are accident prone or hard on their vehicles could potentially pay a ton in lease penalties at the end of the lease term. Most leases have an option “To Buy Clause” that allows the leaser to purchase the vehicle. In some cases this can be a really good option. In normal leasing, if you have kept the vehicle in good working order and kept the miles below the lease limits, you can essentially hand the keys over and walk away. Sure there will be some paperwork, but in most cases it’s a relatively easy process. If the vehicle isn’t in good shape or you have excess mileage, you may get dinged big time for extra charges and penalties. Most leasing companies and dealerships will start reaching out to you near the end of the lease (typically 30 to 60 days out), seeing if you want to lease or buy another vehicle from them. Be prepared and don’t make any commitments, because you will need to do your own homework to see what you best options are going to be. When you first leased your vehicle the leasing company or dealership calculated a monthly leasing fee by estimating a vehicles price over time. In essence they calculate (new-vehicle sale price – residual value) / lease months to determine monthly payments. If the residual value was set too low, buying the vehicle is usually a bad option because the car isn’t worth as much at the end of the lease. 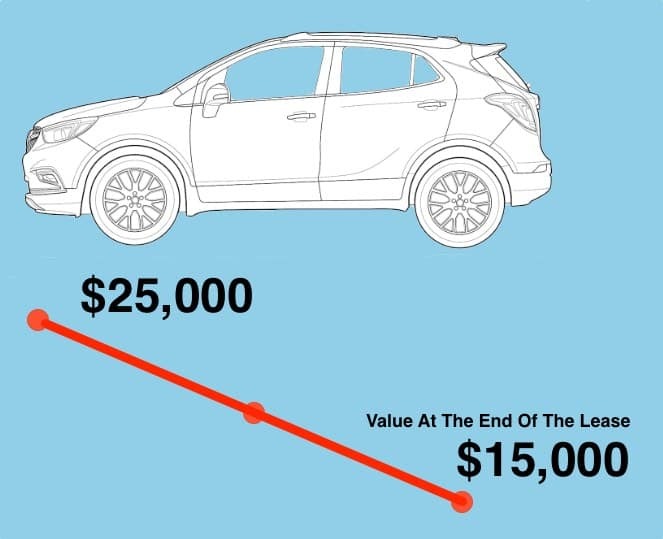 A residual value that was set too high means you ended up paying less in monthly payments than you should have been and the car is worth more. At the end of a lease, if you have maintained your vehicle properly and still like driving it, you might consider buying it. In this situation it is a great idea to shop the used market to see what other used vehicles are selling for and compare them to your leased vehicle. If you feel your vehicle is better than anything you could get in the same price range, that is a great sign that you may want to buy it. Let’s face it, accidents do happen and many drivers treat their vehicles like disposable items. If you are deciding on buying a leased vehicle at the end of it’s leases term you will need to weigh penalties that you may have accrued due to mileage, excessive wear and tear and damage. The more issues you have racked up, the larger the penalties will be at the end of the lease. Lease-end penalties are there to make sure the dealership or leasing company doesn’t lose money. You can avoid the penalties altogether by purchasing the vehicle and that may be your best option. The downside of course is if you don’t like your vehicle or want something new, you will have to pay the lease penalties prior to purchasing something else. When you first lease a vehicle, as part of the residual value calculation, the leasing company determines the maximum number a miles a vehicle can be driven during the lease period. People who exceed the maximum mileage calculated incur mileage penalties. So for instance if a vehicle had a 3-year lease of 12,000 miles a year, the maximum mileage that the vehicle could be driven would be 36,000 miles. Any miles above the 36,000 maximum limit would incur a mileage penalty. The leasing company could include a mileage penalty of $.15 or more for every mile over the lease maximum. A person who drove 37,000 miles then would incur a $150 (37,000 – 36,000 x $.15 per mile over the maximum) mileage penalty that would be owed at the end of the lease. Depending on how much excess mileage is put on the vehicle, it may be a better option to purchase it than to pay the mileage penalty and other penalties that might be associated with the lease. Let’s face it, vehicle shopping can be fun, but it also can take take a lot of time and energy. Buying your leased vehicle can eliminate the hassle of shopping around. Hopefully over the term of your lease you have gotten to know your vehicle’s quirks, likes and dislikes and ultimately know if you would like to keep it long term. So there you have it. While buying a new vehicle can be exciting, buying your leased vehicle might make more sense. In the end it’s you who will decide, so make the right choice and move forward. We are here to help. Please contact Fremont Motors or any of our Fremont Motor vehicle dealerships to discuss your leasing options and what choice might be your best option at the end of your lease.